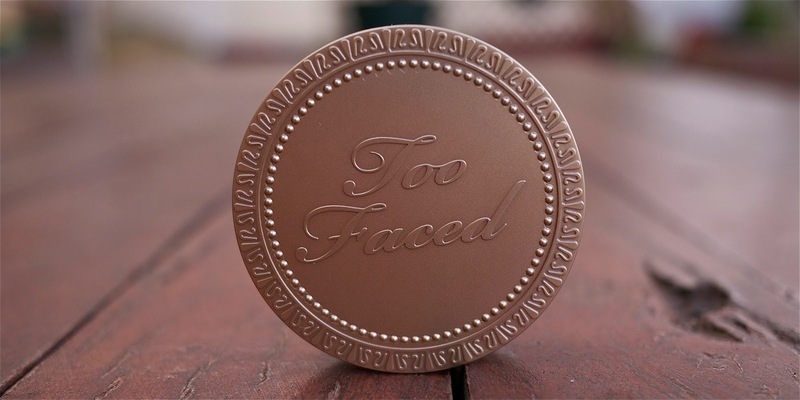 Too Faced Milk Chocolate Soleil Bronzer is a warm toned bronzer aimed at us fairer skin girls. It blends really nicely into the skin, providing my face with the colour it oh-so-desperately needs without adding any of the shimmer we so regularly avoid. It is fairly pigmented for a blush targeted at paler girls. It doesn't pack too much of a punch initially which I actually really like. It means I can be bronzed up as much or as little as I want, depending on my application. Whilst I know that some people like to use this bronzer to contour (don't get me wrong, I have used it like this before and it's not bad - I just prefer something a bit cooler in tone), I really like to use my Too Faced Milk Chocolate Soleil Bronzer to warm up the perimeters of my face. I have two gripes with the Too Faced Milk Chocolate Soleil Bronzer but, given that neither influence the performance of the product, I'm thinking maybe I should just shut up. You be the judge. Firstly, I think the packaging is quite bulky. As you can see from the photo above, it is way thicker than the Sleek Contour Kit (top) or NARS Laguna (middle) which may mean that it doesn't fit nicely into one's collection or that it's impractical for travelling. Just something to think about. Secondly, whilst I loved the chocolate fragrance in the Too Faced Chocolate Bar Eyeshadow Palette, I feel like it's a lot more artificial in this bronzer. This doesn't effect how much I use it, however I'm not big on fake chocolate scents and it may throw other people. All in all, I quite like the Too Faced Milk Chocolate Soleil Bronzer. After being a lover of NARS' Laguna for a really long time now it's been difficult to get myself into the routine of using something else but I'm really liking the product so that makes it a lot easier. If you have a skintone that's darker than a MAC NC/NW25 I'd possibly suggest looking at the normal Chocolate Soleil Bronzer as Milk Chocolate may be a little too light but, all in all, it's a lovely product! Will it mean that I don't replace NARS Laguna when it runs out? I'm not sure..
Have you tried this? What's your favourite bronzer? I've heard such good things about this bronzer. Interesting that the scent isn't as nice as the palette! This looks like a nice natural option to wear on days when I am in a rush and don't want to over apply and buff out my bronzer. It looks like it would blend really easily! This is such a gorgeous bronzer. I have it and it is soooooo perfect for us Snow White skin types! I've got the Chocolate Bar palette on its way to me now, care of DHL as we speak... excellent choices! I've just started using a bronzer to contour (Laguna of course :p) and I'm getting the hang of it. This might be easier for me as it's lighter, (I'm NW15) and chocolate scented. Although it does look pretty bulky compared to every other bronzer I've seen. Ohhh i need it. im so pale most brozers look orange or muddy on me!